"If the name comes out, tourists will flock there". 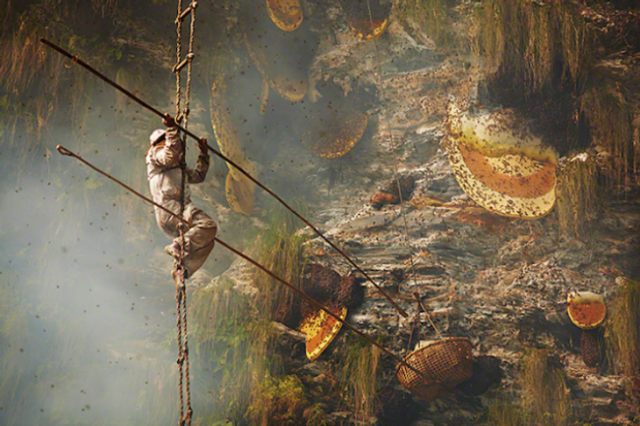 The secret world of Nepalese honey hunters. Andrew Newey has made make a name for himself as a documentary travel photographer capturing vanishing cultures and traditions. His latest expedition involved traveling to the foot of the Himalayas in Nepal to document the Gurung tribe’s bi-annual tradition of gathering honey. These Nepalese honey hunters risk their lives to harvest the honey from the world’s largest honeybee, using the same tools they used centuries ago. Rather sadly, increased tourism, commercialisation and climate change have resulted in a slow decline of the number of bees and honey hunters. Though it dates back centuries, honey hunting was quite an unknown tradition until a 1987 National Geographic documentary enticed tourists, film makers and photographers to explore the region. Thus, interestingly projects such as this present a paradox - by documenting ancient traditions unknown to the western world, photojournalists may actually contribute to the tradition’s disappearance. Luckily, in this instance, Mr Newey would not reveal the exact location of the project. “If the name comes out, tourists will flock there. That would be a disaster", he said (according to NYT article). However, allegedly, commercial publications such as National Geographic require photographers to disclose location and place name, and in this way, often contributing to increased tourism and eventually destruction of nature and decline of cultural diversity. This tradition of hunting honey is a dying one, as are many of the other traditions Newey has immortalized. Between the younger generations heading into the cities in hopes of making a living off the tourism market, and the aging of the elder, experienced hunters, the knowledge just isn’t getting passed down as it has in the past. To add to that, the tourism industry is contributing to the demise of this tradition. For upwards of $1,000, tourists can go on guided honey hunting treks, which leads to excessive harvesting — far more than the twice a year usually done, leaving not nearly enough time for the bees to properly produce the needed amount of honey.